Is the oncoming Halloween season lighting a flame under your tuchas to find an awesome costume? Well, since we do work for a Halloween costume company, we are very familiar with that burning sensation. Do you want in on a secret? All right, since you asked nicely, we'll tell you. A good costume is all about the accessories! That's right if you want some show-stopping photos you'll find that a good prop takes your character poses to a whole new level. Firefighter costumes have a few options when it comes to props but this ax is both lightweight and unique. Toting a hose around all night will not make your Halloween more pleasant, that's a guarantee! 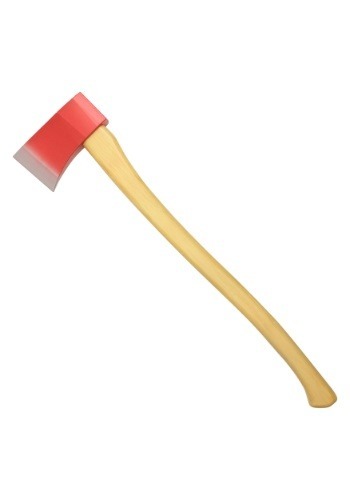 You'll feel like you're ready to save the day when you're swinging this foam ax with its rigid plastic exterior with a light-wood colored handle and bright red head. At twenty-seven inches, it's sure to stand out in pictures and group costumes. There are few costumes as classic as the firefighter. There's a reason that firehouses around the world by printing calendars of their team members, we just love those uniforms! So, whether you're wearing the picturesque red uniform of the past or you're rocking a vivid yellow and tan jumpsuit, you'll need the right prop to bring your ensemble to the next level. So, when you get to that costume party, kick down the door (or simply aggressively open it), and raise your ax. It's time to make sure this party isn't a burnout!